Vihdoin on tullut windows phone kauppaan sovellus APRS paikantamiseen. Itse olen kokeillut Lumia 920 ja 925 pelaa hienosti. 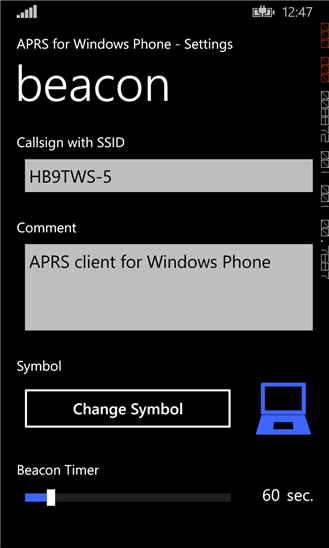 Täältä löydät APRS Windows Phone. Tässä taasen puhelimella toimiva APRS Passcode Generator sivusto. This app is a client for the Automatic Packet Reporting System (APRS). The app implements currently live-tracking of the user's geolocation. For subsequent versions more features will come like APRS messaging, listing nearby APRS stations, provide a map view and others. 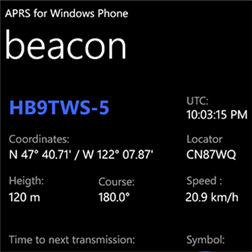 The APRS app retrieves the geolocation from the phone's location service. In compliance with the Windows Store rules the user needs to opt-in before this functionality is enabled. The access to the phone's location service can be granted in the app's settings page for the location service. In order to get access to the APRS Internet Service (APRS-IS) one need to enter a passcode. When you have a valid HAM radio license you can request the passcode by sending your callsign to the support email address or using the contact form on www.radio.cc. If you want to use the app for Citizen Band APRS (cbaprs.de), please do not enter a passcode. The APRS Internet Service provides public access to all collected APRS data. You can look at the data using an internet browser to visit websites like aprs.fi or openaprs.net.